What has forced the government to launch a full-fledged campaign for the Seraiki province? From one angle it seems the PPP wants to make political gains by highlighting divisive issues. From another it looks as if they have run out of ideas and need to drum up the issue of Seraiki province to brighten their chances in the elections after they miserably failed to help the Seraikis during the devastating floods. Not a single rally or procession has so far been staged in support of the Seraiki province yet the government has launched a concerted campaign for it, completely ignoring the genuine demand for the restoration of the province of Bahawalpur, which the Quaid had promised. Carving out a new province on linguistic basis will clearly encourage others to demand division of Sindh and Balochistan on the same basis. The people of Seraiki area remained deprived because of the powerful feudal landlords and Sardars of their area, who were not only elected to the provincial and federal legislatures but also held top constitutional offices including that of president, prime minister, federal ministers, governors, provincial ministers, chief ministers but did nothing for the poor people of their area. The Gormanis, Legharis, Khosas, Gilanis, Qureshis and almost all the powerful landlords, Pirs and gaddi-nasheens remained in power but failed to mitigate the suffering of the Seraiki people. The deprived and poor people of southern Punjab do want development, jobs, schools, roads and basic infrastructure. Besides, the districts of Muzaffargarh, Rajanpur and DG Khan faced devastation caused by floods during the tenure of this administration but the PPP government failed to help the masses in any way. Some analysts believe that the present campaign is aimed at winning back the support of the disenchanted people of these flood-hit areas who had voted for the PPP in the 2008 general elections. The princely state of Bahawalpur had become part of Pakistan on the assurance that its separate status would always be maintained. Sensing very bad financial situation of a newly born state, the then ruler of Bahawalpur generously donated money and other valuables to Quaid-e-Azam in 1947 and help Pakistan to start its journey. Even today, almost all the ethnicities reside in Bahawalpur in a peaceful manner and there has never been any lingual tussle. Following are some bullet-points explain the Bahawalpur issue. In 1947, Bahawalpur’s accession to Pakistan agreement was signed by Muhammad Ali Jinnah and the then Ameer of Bahawalpur Nawab Sadiq Muhammad Khan Abbasi. Bahawalpur thus became the first state which announced accession to Pakistan as a “federating unit” and this was clearly reflected in this agreement. – On 29 April 1951 a supplementary accession agreement was signed by Nawab Sadiq and Khawaja Nazimuddin under which Bahawalpur was made province of Pakistan (federating unit) and under this agreement the 1952 polls were held in the province and a provincial government was set up. – In the draft constitution of 1954, officially printed by the Printing Press of Pakistan, Bahawalpur had the status of a province. – In 1955 one-unit was announced and Bahawalpur became part of West Pakistan. But even at that time an agreement was signed with Bahawalpur that it is being made part of West Pakistan as a federating unit. – In 1970, under an LFO issued by military ruler Yahya Khan, one-unit was abolished and Bahawalpur was made a division of Punjab. Since that day the people of Bahawalpur are demanding that Bahawalpur’s status of a separate federating unit should be restored. – In May 2011, members of Senate’s standing committee for Safron, including veteran politicians like Hasil Bazango from Balochistan, Prof Ibrahim from KPK, Abdul Ghafar Qureshi from Sindh, Hafiz Abdur Rasheed from FATA, Muhammad Ali Durrani and other senior members of the Upper House visited Bahawalpur and thoroughly examined all accession documents and agreements and unanimously held that pre-1955 status of Bahawalpur as a separate federating unit/province should be immediately restored. The people of Bahawalpur don’t want to become part of another newly formed province in any case and if at any point of time someone attempts anything like this, there is no doubt that the people of Bahawalpur will resist such a move. The constitutional requirement for creating the Seraiki province is also being ignored, as the PPP does not have the required numbers to do so. Clause 4 of Article 239 of the Constitution dealing with the subject of creating a new province reads: (4) A Bill to amend the Constitution which would have the effect of altering the limits of a Province shall not be presented to the President for assent unless it has been passed by the Provincial Assembly of that Province by the votes of not less than two-thirds of its total membership”. The top government leaders are not telling the people how they will fulfill the requirement of this Article. Senator Muhammad Ali Durrani while commenting on President Zardari’s recent speeches in Multan said if President Zardari’s assertion for the Seraiki province is considered seriously then Seraiki is spoken up to Sukkhar in Sindh and Dera Murad Jamali in Balochistan. “Is the president talking of making these areas of Sindh and Balochistan part of the proposed Seraiki province?” he questioned. Believe in your dreams and not in your despairing thoughts. Feed your faith but starve your doubts. Always remember tough times never last but tough people do. What scientists say about the Embryonic stages? Professor Emeritus Keith L. Moore is one of the world’s most prominent scientists in the fields of anatomy and embryology and is the author of the book entitled “The Developing Human”, which has been translated into eight languages. This book is a scientific reference work and was chosen by a special committee in the United States as the best book authored by one person. Dr. Keith Moore is Professor Emeritus of Anatomy and Cell Biology at the University of Toronto, Toronto, Canada. There, he was Associate Dean of Basic Sciences at the Faculty of Medicine and for 8 years was the Chairman of the Department of Anatomy. In 1984, he received the most distinguished award presented in the field of anatomy in Canada, the J.C.B. Grant Award from the Canadian Association of Anatomists. He has directed many international associations, such as the Canadian and American Association of Anatomists and the Council of the Union of Biological Sciences. In 1981, during the Seventh Medical Conference in Dammam, Saudi Arabia, Professor Moore said: “It has been a great pleasure for me to help clarify statements in the Quran about human development. It is clear to me that these statements must have come to Muhammad (Peace be upon him) from God, because almost all of this knowledge was not discovered until many centuries later. This proves to me that Muhammad (Peace be upon him) must have been a messenger of God. In comparing a leech to an embryo in the alaqah stage, we find similarity between the two. Also, the embryo at this stage obtains nourishment from the blood of the mother, similar to the leech, which feeds on the blood of others. 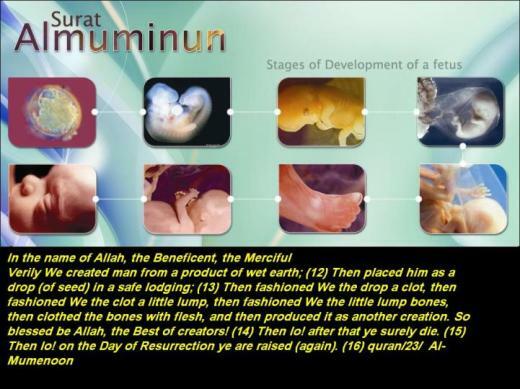 The suspension of the embryo, during the alaqah stage, in the womb of the mother. The third meaning of the word alaqah is “blood clot.” We find that the external appearance of the embryo and its sacs during the alaqah stage is similar to that of a blood clot. This is due to the presence of relatively large amounts of blood present in the embryo during this stage4. Also during this stage, the blood in the embryo does not circulate until the end of the third week. Thus, the embryo at this stage is like a clot of blood. The Arabic word mudghah means “chewed substance”. If one were to take a piece of gum and chew it in his or her mouth and then compare it with an embryo at the mudghah stage, we would conclude that the embryo at the mudghah stage acquires the appearance of a chewed substance. This is because of the somites at the back of the embryo that “somewhat resemble teethmarks in a chewed substance”.